The OG2 Rolling Stash Phone Case is not only perfect for those on the go, but also those who sometimes need a little more discretion. Are you looking for a phone case that doubles as a stash case, which also has adequate storage for a lighter, papers and any legal herbs or tobacco? If so, the iRollie OG2 is for you. 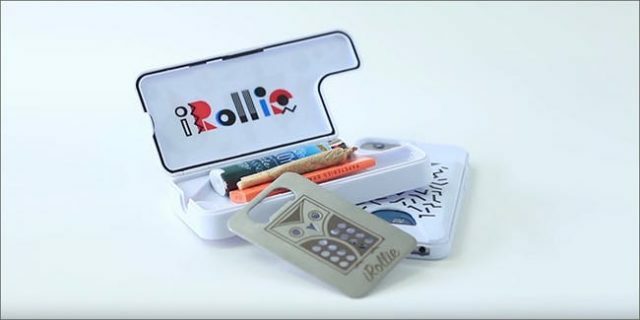 The team behind the original iRollie case is proud to introduce the new OG2 Roll & Stash Case – a more discreet and effective way to store, roll, grind and pour your legal herbs and tobacco, especially for those smoking enthusiasts who are always on the go. The story of iRollie starts with founders Luke and Jo as two 19-year-olds in college, living on practically nothing – they were in college, after all – and relying on the success of the first generation iRollie. There have been other products, too, such as the Paris OG Rolling Tray Case, which gained so much traction that the two founders ended up joining Afroman’s tour and offered a custom iRollie case for the singer. But Luke and Joe didn’t stop there, bringing on a chief design officer, one with well over a decade of design and manufacturing experience, which has led to the next product: the OG2 Rolling Stash Phone Case. The OG2 Rolling Stash Phone Case is not only perfect for those on the go, but also those who sometimes need a little more discretion, which comes in the form of a detachable rolling tray box. That just leaves a discreet and protective standalone case that holds cards and IDs. In that detachable rolling tray box, you’ll find the grinding card, which also doubles as a bottle opener. But, say if you forgot the grinding card (or just want an even finer grind), there is a small prism surface that’s built into inside the case, which allows you to grind those legal herbs and tobacco. At the end of that tray, is a funnel-like design, which allows you to easily pour your herbs or tobacco into any bowl, pipe, papers or vaporizers you choose. That means you’ll be able to roll up without losing any weed. The tray also has enough space to hold a lighter, papers and any pre-rolled smokes you have, too. When the tray is closed, it seals in any odors, thanks to the silicone gasket that lines the lid. That perfect seal also keeps any moisture and debris out of the tray, so you can take this on all your adventures, knowing your favorite herb and tobacco are safely stored. The OG2 will be available for the iPhone 6, 6S and 7, as well as the iPhone 6+, 6S+ and 7+, too. And, yes, there will be iRollie cases for Android phones, as well as other makes. .